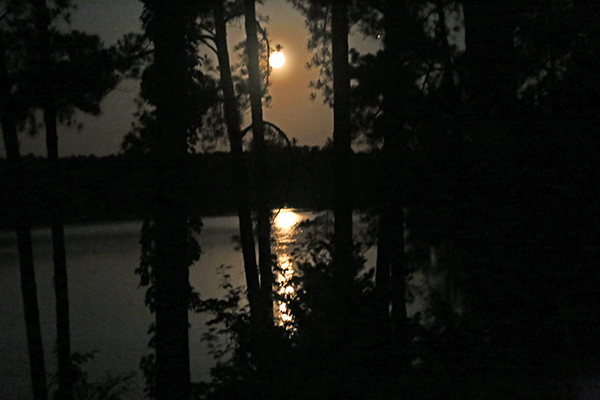 The Thurmond Lake Sail and Power Squadron will host a community Moonlight Cruise on Monday, June 20, the night of the June full moon. All boats are welcome to join us for this first Moonlight Cruise of the 2016 boating season. We will meet at 8 p.m. at Eagles Cove (GPS N33 55′ 40″, W 82 24′ 30″) where we’ll do a quick light check and position ourselves for the sunset at about 8:30. Moonrise is at about 7:45, so by 9:00 p.m. we should be able to see signs of the moon. We’ll begin a slow cruise up Little River to enjoy the full moon and get people back to their boat slips. We expect to have all boats back in SLV slips by11 p.m. For those with slips off the Savannah River, let us know at the gathering and we’ll make any arrangements at that time. PLEASE NOTE: All boats must have working navigation lights. It is against the law to operate a boat at night without them. Other lights do not satisfy the legal requirements. *In the event of weather issues, we’ll look to move this ahead or behind as much as a couple of days, whatever Mother Nature dictates. *This is an OPEN event. No RSVP required! Just show up. *Some assembly required. Batteries not included.